Apple really, really wants everything to "just work" and when it does, it's fantastic. When it only nearly does, it's bewildering. Such as right now when there is music on your Apple Watch but you can't be sure where it's coming from —or why you can't actually hear it. The question of where your music is actually coming from vanishes if you have great Wi-Fi, if your Watch is a cellular one, if you have brilliant reception and if you have an unlimited contract. Otherwise, you're not sure if the music you're listening to now will be available to you when you're out jogging without your phone. And if you are phoneless and needing a pick-me-up album, you need to know whether that Taylor Swift album is eating up your cell data or not. There is surprising confusion and inconsistency in it all. And if some of it can't be untangled by anyone but Apple, at least you can learn when it's going to cost you money or not. 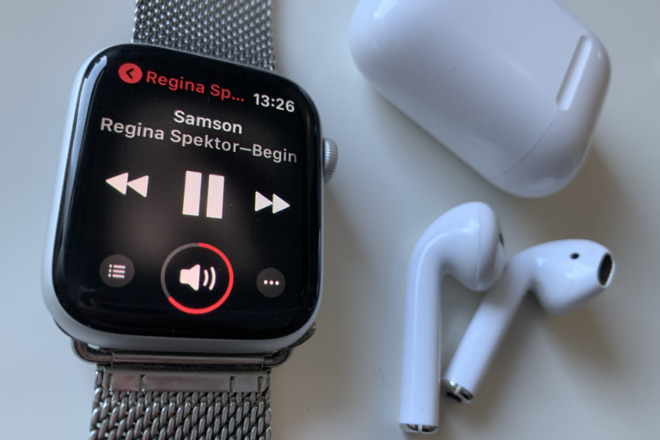 There is the issue of how you get music onto the Watch but first there's the more immediate question of how you get to hear any music at all. Even the Apple Watch Series 4 with its improved speaker will not play music or podcasts directly. You have to pair Bluetooth headphones to the Watch. Only, if you have already paired, say, AirPods to your iPhone, then those AirPods appear as being paired to the Watch without you doing anything. That is very good, except if you're trying to fathom out whether the AirPods in your ear are playing from the Watch or the iPhone. If you haven't already paired headphones to your iPhone, you need to do that or to add them directly to your Watch. Check what you've already got paired, just in case. On the Watch, choose Settings, Bluetooth. Bizarrely, while this will list you the Bluetooth devices that you have paired, and whether they're connected or not, it won't let you add a new one. To do that, you have to go the Music or to the Podcasts app and start playing something. As soon as you do, the Watch will pop up a dialog asking you to Choose where to play audio. Any currently paired Bluetooth headphones will be listed and then there's a button called Connect a device. When you tap Connect a device, the Watch jumps you from the Music app to the Settings one and straight into Bluetooth. It's the same Bluetooth settings you just looked at, but this time there's no list of currently-paired headphones. There's just a Searching... as it looks for any not-yet-paired headphones in range. This is one of those cases where you so doubt that Apple would do it that you go back into Settings, Bluetooth and start force-pressing, trying to find a Connect or an Add button you've missed. If you're an Apple Music subscriber, you can raise your Watch and ask Siri to play you anything. Without exception, though, the music you hear will be played via your iPhone. Even if you have the particular track downloaded to your Watch, Siri will stream it instead. You can see this by opening the Music app, which you can either do directly or if something is already playing, by tapping on the status bar icon at the top of your Watch face. When the current track is being streamed from your iPhone, the Music app will show you that in the top row of the play/pause screen. It will say iPhone. 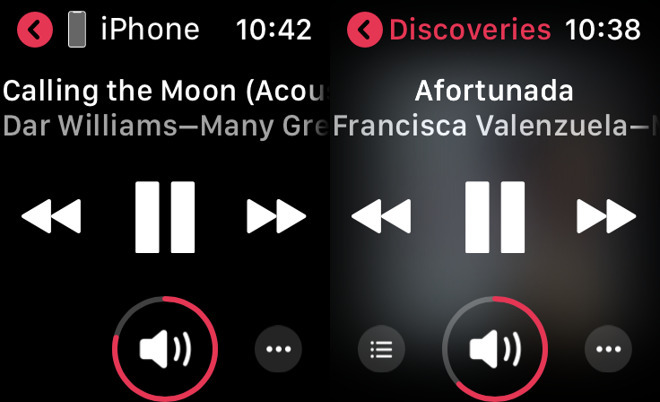 Whereas if you're playing from a track that's physically on the Watch, the same line will instead show the name of the playlist or album that it's on. Devices are shown in white, that playlist title is in red. Only, say you were out on a run and left your iPhone at home. You've been listening to music on your Apple Watch and so, naturally, the Watch's Music app shows you the track you've been listening to. It shows that above the regular play/pause icon. Now you're back, however, you call out to Siri to play something else and your iPhone does so. Your Watch's Music app does not change. It still lists the last track you were playing. Your AirPods have automatically switched over to listening to your iPhone and normally you could control the volume and play/pause on the Watch, but now you can't. Say your Apple Watch is on Wi-Fi but for some reason your iPhone isn't. Maybe you've forgotten to switch off Airplane Mode or maybe the battery has run out. Siri on the Apple Watch will still request the music you ask for from Apple Music. It will find that music and act in every way as if it were going to play it, but it stops. 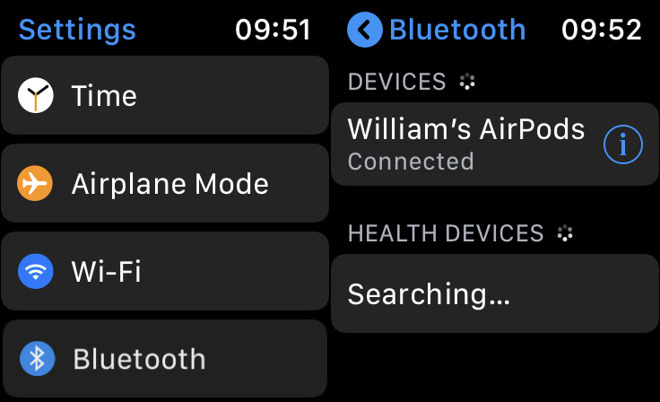 Despite having found the track over its own Wi-Fi connection, the Watch is asking the iPhone to play it —and the iPhone's Wi-Fi is off. Since the iPhone can't connect to Apple Music, the track fails to play and the Watch can only tell you that it's Not Playing. This is not playing nice, that's what this is. Here's one more issue. If music is playing on your iPhone, the Watch will again show the Music icon in its status bar. However, tapping on it doesn't take you to the regular play/pause screen. Instead, it takes you to Now Playing. That shows you a list of what is playing or is currently paused on your iPhone and Apple Watch plus, if you have them, your HomePod and Apple TV. There's more, though. You can also get to Now Playing via the Apple Watch Music app —but it's a different Now Playing. To check it out, go into the Music app on your Watch and it will either be showing you a list of playlists or the screen will have a current song with play/pause. Whenever you're on the playlists page, you can scroll to the top. Above the actual playlists there will typically be three other sections. On iPhone, Now Playing, and Library. Tap on Now Playing and you go to the play/pause page with the current song listed. You can solve all this confusion by just buying a cellular Apple Watch and an unlimited data plan while you only ever go to places with good reception. Alternatively, you can get some music onto your Apple Watch itself and listen to that. There are then issues over how else you can listen to your Watch's music automatic selection or prepare your own. There's the issue over how much you can do on your Watch and how much still needs your iPhone. Now that you know how music on Apple Watch works, though, these are all topics for another day.